The Oklahoma Legislature has overridden Gov. Brad Henry's veto on two pieces of pro-life legislation. House Bill 2780, by state Rep. Lisa Billy, requires that doctors provide women information obtained from an ultrasound prior to performing an abortion. House Bill 2656, by state Rep. Dan Sullivan, makes it illegal to sue a doctor claiming "wrongful birth" because the doctor failed to convince the mother to abort a child. The House voted yesterday to override; the tally was 81-14 (HB2790) and 84-12 (HB 2656) in favor. The Senate voted this morning, with both bills receiving a vote of 36-12. House voted 81-14 to override the governor’s veto, which was above the three-fourths vote required. 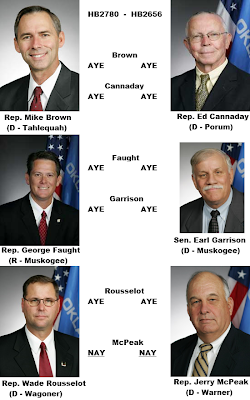 Here is how the Muskogee-area legislators voted (click for larger view). Rep. Jerry McPeak was the ONLY local legislator to vote against the veto override. 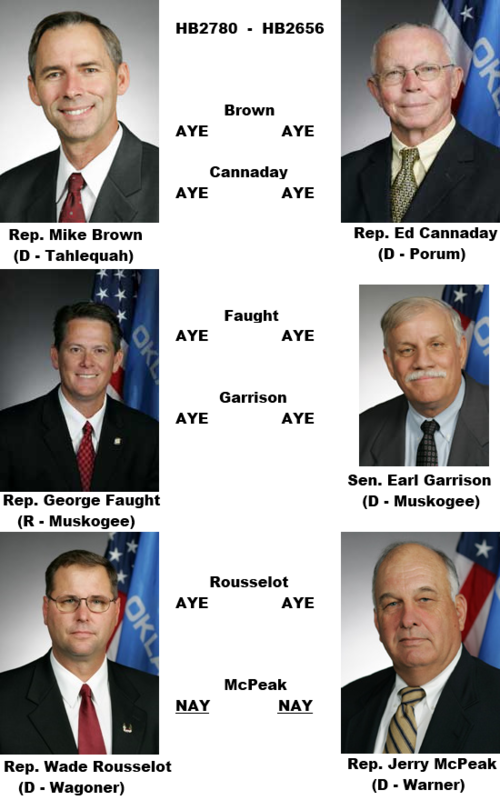 Kudos to State Reps. Mike Brown, Ed Cannaday, George Faught, Wade Rousselot and State Sen. Earl Garrison for standing up for LIFE.